C's Exterior Designs is a leader in home & business exterior design & remodeling in Billings, MT. Affordable, high-quality, & experienced siding contractor, roofing contractor, & window contractor. Licensed and insured and BBB accredited. We use only the best quality materials available. We understand that choosing the best home improvement contractor can be tricky. That's why we take extra time to ensure you are comfortable choosing us. Contact us for a free estimate on any of your exterior remodeling projects. R.I.C. is a local business that helps homeowners complete or consult on home remodels and makeovers, as well inspections for new home buyers or sellers. The siding of your home is a hugely important factor when it comes to first impressions; a damaged or mismatched exterior can cast a negative light over a property’s entire aesthetic! If you need new siding installed, or your exterior is in need of repair, repainting or replacing, a Molt, MT siding and exterior contractor can help you out. What types of siding services do Molt exterior contractors provide? Wood siding needs more maintenance than less-expensive, low-maintenance vinyl siding, but with proper care it will outlast vinyl siding, which can fade and crack over time. Your Molt, MT contractor might also suggest fiber cement siding, which is fire resistant and termite-proof and can come with a warranty of up to 50 years. 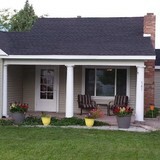 Find siding and exterior contractors in Molt, MT on Houzz. Narrow your search in the Professionals section to Molt, MT siding and exterior contractors. Find out how long a Molt, MT exterior remodeling contractor has been in business, view portfolios, read reviews and get contact information.